Capture AUC Competition aimed to capture and frame the unique essence of AUC community as a result of the continuous conversation with the campus; the goal of the participants was to capture that dialogue. This was achieved by considering daily casual routines, planned and unplanned activities and special ceremonial events. Winning photos will be featured in Dr. Abdelhalim Ibrahim's book "Architecture of Collective Memory" by James Steele. First Prize Winner Mohamed Ashour. Caption: The gate of HUSS building laid out in geometric patterns and bright and dark colors, serving people; not only with stairs but also ramps for the less-abled people to feel more satisfied. This photo was awarded because it integrated and gave meaning to the interplay between public and private. This photographer did not hesitate at all to take that image, instinctive action. The photo did not stop at merely capturing activities, but gave more; the incredible story of the pockets. 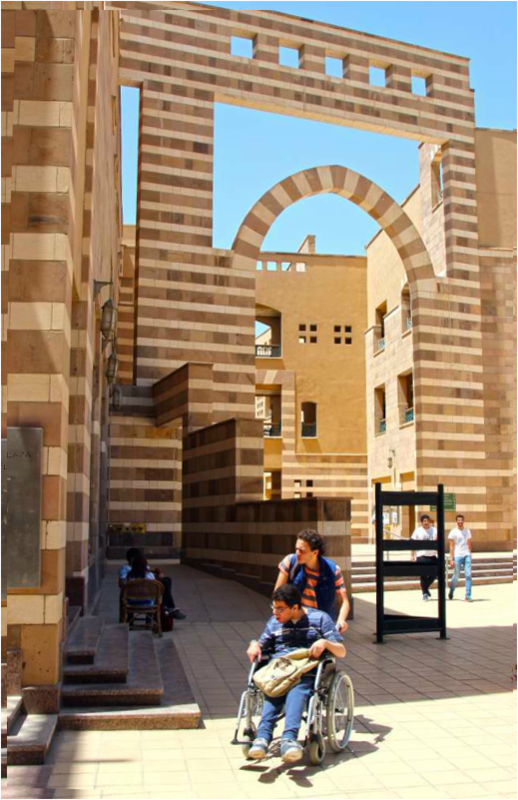 The layering of two students, a pocketed ramp, an arched gateway, and architecture. The photo captured kids having great time, studying college level and managing their varying disabilities. This articulation shows that this is a contemporary campus. The photo also holds architects responsible for designing for the disabled and the less-abled. Second Prize Winner Yara Saeed. 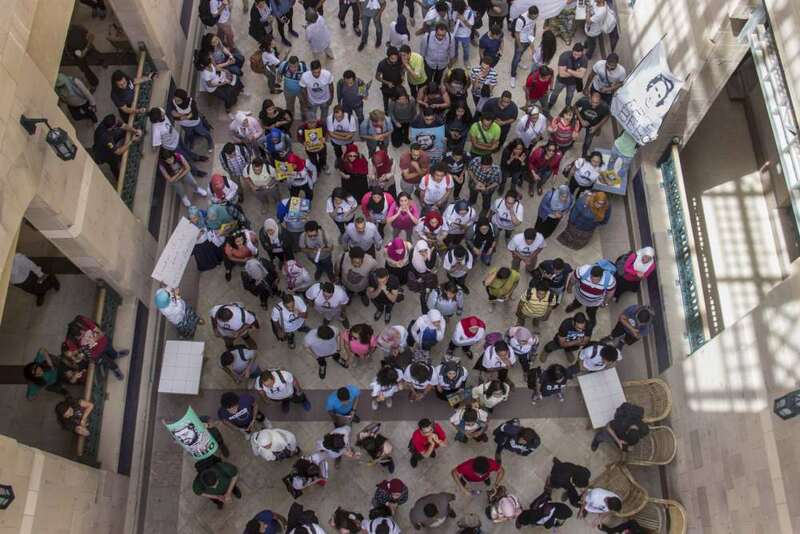 Caption: Marching along the campus’ spine, students chant in protest against the arrest of fellow colleague Ibrahim Tamer “Bebo”. This photo was awarded because the jury realized and appreciated its power, the act of procession. The layering of people behind the arch or on the sides of the procession path witnessing the movement and responding by making way for it. The sophistication of the image composition captured architecture on a scale local to the event of procession confined within the carefully designed path yet the movement of the mass informed the viewer about the continuity of that path. Third Prize Winner Ehsan Abushadi. 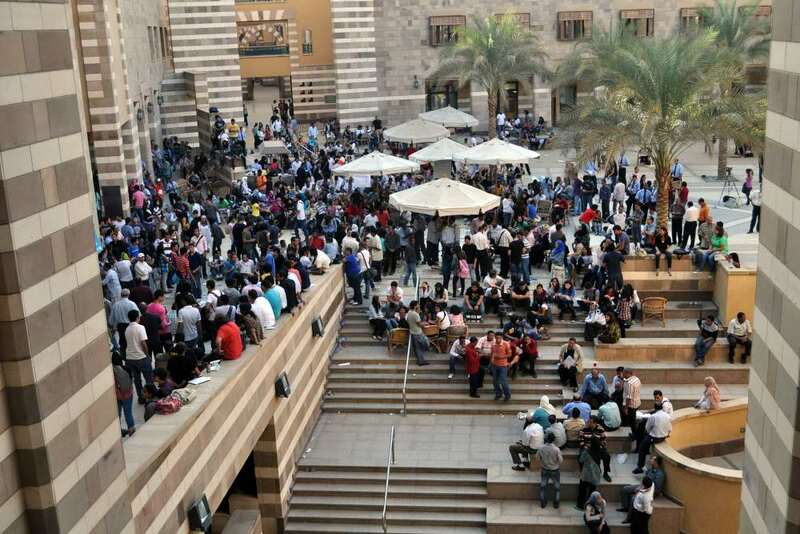 Caption: The HUSS plaza during the nine-day September 2011 student and workers’ strike, where the AUC community was brought closer than ever in years with faculty, staff and alumni participation. This photo was awarded because it captured the deliberateness; the redefining of the steps. This was an act of taking over a space (possession) and doing something different than intended with it and interacting with the space. The event went beyond the intention of the designer. The image also captured the way the quality of the space adorned the event. The jury that will evaluate the entries will consist of a CDC representative, a member of the Architecture Department faculty at AUC, and professional photographers. Photographs will be featured in Dr. Abdelhalim Ibrahim's Book: “An Architecture of Collective Memory”. Winners will also receive a signed copy of the book.